The Santa shot is a fun, colorful shooter that is perfect for Christmas parties. Dominated by mint, it has a sweet, fruity surprise waiting for you at the bottom of the glass. It is one tasty shot you'll definitely want to share with friends. 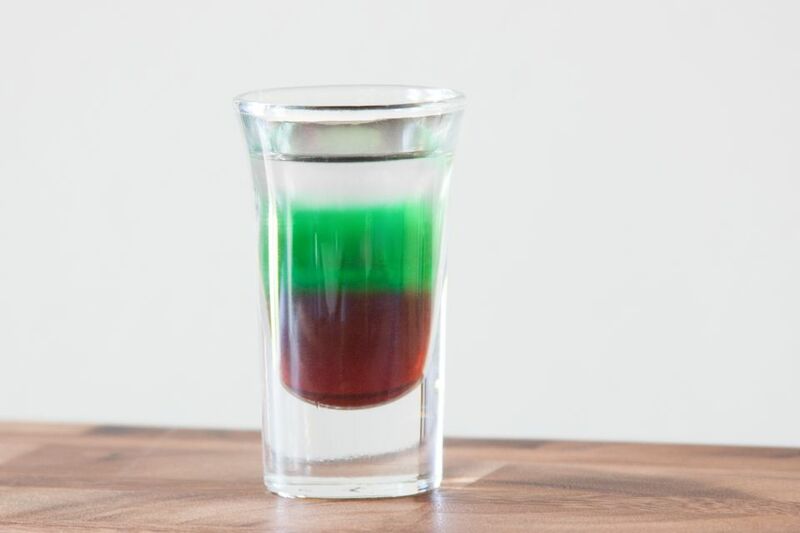 Inside this layered shooter, you'll find grenadine, green crème de menthe, and peppermint schnapps. When layered, these three ingredients create a red, green, and white (technically clear) shooter with double the minty flavor that is ideal for any holiday celebration. To get the full "Santa" effect, however, you'll want to brush up on your layering technique. In a shot glass, pour the grenadine until it's one-third full. Float the same amount of green crème de menthe on top by pouring it slowly over the back of a bar spoon. Float peppermint schnapps on top to fill the glass, again using the bar spoon. This is a very simple shot to make, but a few tips will help you out. Before you try it out at a party, you may want to practice making it on your own to ensure everything goes well when you're in the spotlight! The actual amount you pour of each ingredient will vary depending on the size of your shot glass. Aim for each layer filling one-third of the glass and you'll be fine. The key to any layered shot is to pour the ingredients in the order of their specific gravity: heaviest liquid first, lightest last. Grenadine is a very thick syrup, which is why it's almost always on the bottom. Crème de menthe falls in the middle because it includes a great deal of sugar, just like all crème liqueurs. Peppermint schnapps is the lightest of the bunch because, as you may have guessed, it has the least amount of sugar as well as the most alcohol. Keep in mind that there is a white crème de menthe available. While it will create the same taste and has the same density, the Christmas theme would not be complete without the green version. If you only have white crème de menthe, simply stir in a couple drops of green food coloring before pouring the shot. Peppermint schnapps can vary greatly from one brand to another, though most should float just fine on top of the green layer. You will get the most distinct top layer if you use a higher proof schnapps, which can be up to 100-proof (50 percent ABV). It's possible that an 80-proof schnapps will sink into the crème de menthe layer. This will not affect the drink's taste, just the visual effect. If you want to give the Santa shot a chocolate twist and cut back on its mintiness, there's a simple solution: pour white crème de cacao that's been tinted green with food coloring. It has nearly the same density as crème de menthe, so it should layer up just as well. In a similar manner, the white layer can be swapped out for a number of other ingredients. Vodka would be an excellent choice, as would tequila. Both should float perfectly and take some of the mintiness out of the drink. How Strong Is a Santa Shot? The strength of the two liqueurs will affect the shot's intensity and both can vary. Crème de menthe is generally bottled around 50 proof and, for this example, let's assume you pour 100-proof peppermint schnapps. With no dilution to factor in because it's a layered shot, it will be around 25 percent ABV (50 proof). That's the same as a straight shot of crème de menthe, only with a fruity twist!